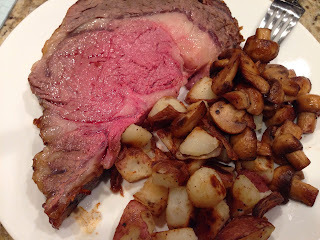 Hubby loves prime rib so I make this once in a while. Only really the two of us eat it so we always have leftovers, which is AWESOME when we have it thinly sliced in instant noodles or other soup noodles. Note: It's easiest to thinly slice the leftover prime rib (or any slab of meat) if you put it in the freezer first for about 15-20 minutes to firm up a bit. In a small bowl, mix together salt, pepper and granulated garlic. Store in an airtight container. Place prime rib roast fat side up and bone side down on an aluminum foil lined baking tray. For every 5 pounds of roast, rub all over with 1 tablespoon of seasoning. Serve with veggies and potatoes. Preheat oven to 500F. Place prime rib roast fat side up and bone side down on an aluminum foil lined baking tray. For every 5 pounds of roast, rub all over with 1 tablespoon of seasoning. Roast for 5 minutes per pound (11 minutes per kilogram). Turn off heat and let the roast rest in cooling oven for 2 hours. DO NOT OPEN!